Trafton chosen for Hamilton alumnus award - Hamilton School District. 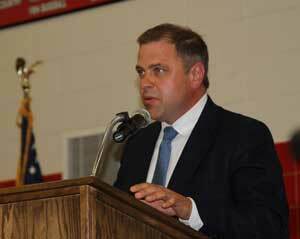 Graduate Keith Trafton was presented with the 2014 Hamilton High School Distinguished Alumnus Award at the school’s June 14 graduation ceremonies. A 1986 graduate, Trafton is the chief financial officer (CFO) and managing partner of the Bartolotta Restaurant Group. After high school, Trafton continued his education at the University of Wisconsin – Milwaukee where he earned a bachelor’s and master’s degree in business administration. He spent nearly 20 years in the manufacturing sector, working in areas of accounting, operations, sales, human resources, information technology and leadership. He rose to the role of president and chief executive officer for a leading international contract manufacturer headquartered in Milwaukee serving the agricultural, construction, industrial, transportation and defense markets. He has been with the Bartolotta group since 2008, and in 2012 was named the Small Private Company CFO of the Year by the Milwaukee Business Journal.